Preheat the oven to 350°F. Line an 8-inch square baking dish with foil, leaving an overhang. In the bowl of a food processor, pulse the graham crackers until finely ground. Add the butter and pulse until moistened. Press into the bottom of the prepared pan. Bake until lightly browned and set, about 8 to 10 minutes. Let cool and reduce the oven temperature to 300°F. Place the cream cheese in the bowl of a food processor and pulse until smooth (you can also use an electric mixer). Add the sugar, eggs, egg yolk, vanilla bean seeds, and salt and pulse until well combined and smooth. Pour the mixture into the prepared pan. Bake until the cheesecake is set but still slightly jiggly in the center, about 45 minutes. Do no overbake. 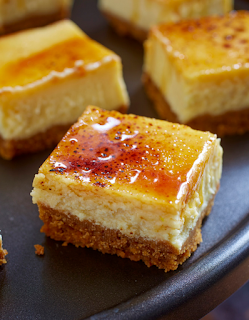 Place the cheesecake on a cooling rack to cool completely in the pan. Cover and chill until firm, at least 2 hours. Using the foil overhang, transfer the cheesecake to a work surface and cut into squares. On a heat-safe work surface, sprinkle the tops of each square with sugar and torch the tops with a kitchen torch until it turns a deep amber color. Alternatively, use a broiler to brown the sugar. Refrigerate until ready to serve.